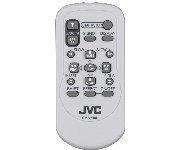 • The Remote Control as original supplied with your unit. • Remote Functions: Start/Stop, Zoom, S.Shot, Display, Rew-Slow, FF-Slow, Rew, FF, Play, Stop, Insert, Audio Dub, Shift, Effect, and On/Off. The Accessory Store is operated by East Coast Transistor Parts Inc.